I first read Maus when I was in 7th grade and I can recall the experience almost like it was yesterday. The book was created by Art Spiegelman and has been nominated for over 10 national and international book awards. In the graphic novel, Spiegelman retells the account of his father, Vladek Spiegelman, a Polish Jew who survived the Holocaust. The story switches between present-day interviews between father and son and a narrative of the father’s experience in Europe from the 1930’s up to 1945. 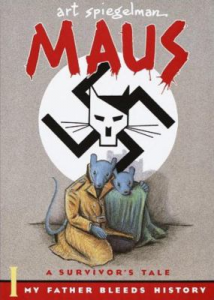 Maus is not only an incredible account of survival but is also a personal tale of the author’s relationship with his family and their inter-generational differences. Maus is a powerful book about an important part of human history. The biography remains a landmark graphic novel with elements that stick with the reader. The gritty artwork, excellent writing, and the personal touch make this a must-read title.